This month is my 10 year anniversary with Blueleaf. Over the last decade, things have changed a fair bit in the industry, as well as within Blueleaf. The team has grown over the years, bringing in new people to help move us forward; we have moved from our spiritual home of the Old Barn in Spurstow to our new office in Tattenhall, in addition to opening up a London office in response to our growing number of clients down there. When I joined Blueleaf, there were only 4 of us (including Adrian) and the projects were massively different to what we work on now. We did a lot of print work for British Cycling and projects for local companies, including branding, advertising and small web projects. Most of the early web projects were designed and built by myself using nested tables in Dreamweaver – slightly different to the multinational ecommerce sites that we now deliver. You'll be glad to know I am no longer hands-on with the build of the sites we develop! Personally, a lot has changed for me in this time as well. I met my wife, moved to a small village in North Wales 70 miles from the office and had twin girls – well my wife did, but like so many things over the last 10 years I think of it as a team effort. Anyway back to work, I thought a nice way to mark this milestone would be to pick 10 projects or clients that stand out for one reason or another, as a kind of potted history of my time at Blueleaf. 1 - Tenovus My first project for Blueleaf was a branding pitch for Tenovus, who are a Welsh cancer charity. We took the old brand and gave it a much more modern feel that could be rolled out across all marketing materials. We won the pitch and went on to work with them for several years on all kinds of promotional literature, websites and information leaflets. I really took the charity's work to heart and ended up doing several events for them to help raise funds. Firstly, I did the 3 Peaks Challenge, where you have to climb the tallest peak in Wales, England and Scotland in 24 hours. I did this with a small team that included a very youthful Rob Smith. After the 3 Peaks, I ran the London Marathon with Chris Jones; well it was more of a fast walk, but we got round. Not sure if he waited for me, or I waited for him, but either way we crossed the line together, just beaten by a man dressed as a 8ft furry trophy. 2 - British Cycling When I first started at Blueleaf, most of the work we did was print and a large part of this was work for British Cycling, including their quarterly Racing Calendar publication, annual reports, training manuals, certificates and websites. To be honest, I have never really been into cycling and after setting tens of thousands of pages of technical information and event detail, I never felt inspired to get into Lycra and hop on a bike. I have included British Cycling here as they really highlight how we have changed as an agency over the years, but also how we have kept our core values of customer care and service. 3 - JKSL One of the projects that stands out for me is a set of adverts we did for JKSL (Japanese Knotweed Solutions Ltd). The advert highlighted the fact that a piece of root the size of a fingernail could spawn a new plant. We wanted a strong shot of a hand giving a single finger salute to illustrate this and to give a confident no-nonsense message. As the budget was tight and stock photography was not really an option, we ended up with me and the Creative Director in the toilet with the lights off, shooting his hand. It must have looked more than a little odd to the rest of the team. The ads looked great and led to a little campaign of hand gesture-based adverts. We did have one publication refuse to run the advert, so we amended it to pixelate the hand, put "Censored" over the top and directed readers to the website for an uncensored version. This worked really well and was even more powerful than the uncensored version. 4 - Pictures to share Pictures to share are a local non-profit social enterprise company that produce books for people with mid to late stage dementia. I have worked with them from the very beginning on the initial branding, promotional literature and websites, as well as working closely with them on the design of all their books. I still work on their books now, but Blueleaf asked me to work independently for them to help keep their costs down, which says a lot about the team here and our desire to help. 5 - Blueleaf Over ten years I have done a fair bit of work on our own projects, but the one that stands out was our "my heart rules my head / my head rules my heart" brochure. The brochure was to promote the two sides of the agency – our creative hearts and technical heads. If you read the brochure from one end it was about heart, then if you flipped it and read it from the other end, it was about our heads. The centre spread where the the two halves met said "whichever way you look at it, Blueleaf makes sense". We thought making an ambigram out of the word Blueleaf would be a great visual representation of this - an ambigram being a word that reads the same whichever way you look at it. Being a bit of a type geek, I thought I really wanted to give it a go. It took me bloody ages, but I loved doing it and was really happy with the end result. The whole brochure was very well done, each spread was really worked into with great typography, photography and special finishes like blind embossing. The brochure was also the first time we showed off the new logo and typeface I had designed for us. 6 - Ena Shaw For the last 6 years, we have been working with Ena Shaw, the UK's premier curtain and blinds manufacturer. During this time, I have worked on all kinds of projects including branding and websites for their own brands, as well as websites for the brands they supply, including Next, Debenhams, BHS, Tesco and Homebase. Although I have really enjoyed working on sites for massive name brands, my favourite Ena Shaw project was for Curtain Express, which is Ena Shaw's own curtain brand that sells online as well as from concessions within department and home stores. The project included branding, web design and roll-out of the brand onto literature and point of sale. I was really happy with the end result. 7 - Co-operative Energy We worked with Co-operative Energy from the very start, when they were just getting established in the energy market. We helped establish the brand online, working on the marketing site as well as the customer portal and mobile app. The mobile app is what stands out for me, as this was my first experience of designing an app, rather than designing for web and a totally different user experience. 8 - Laura Ashley We have been working with Laura Ashley now for around 6 years. During that time I have worked on several websites, including the brand new responsive site that we are currently working on and the first DADI award-winning site we created. The sites have won several awards and we have built a great relationship with the team over the years. As well as working on the design of the sites and a broad range of other projects including email marketing and flash banners, I also take care of the images for the Made to Order and Made to Measure ranges. We create images for all the different shapes in the Laura Ashley collection in the current fabric range. We currently produce over 200 shapes in over 130 fabrics, which is a lot of images, not including the shades and curtains. For the new site, we created over 60,000 images which kept me busy and left me with more knowledge about sofas and curtains than I ever thought possible. 9 - Red Bull I have really enjoyed working with Red Bull over the last 3 years. As a designer, working with Red Bull is a dream job due to their amazing imagery and exciting content. I've had the opportunity to work on the redesign of international sites for some really cool events, including X-Fighters, Cliff Diving, Crashed Ice and Air Race. To start with, we were working on sites that worked within the constraints of the existing FatWire CMS, before moving onto our own bespoke platform that allowed us to use the content in a much more impactful and engaging way. We have gone on to work with the Formula 1 teams at Infiniti Red Bull Racing and Toro Rosso, as well as the Junior Team and Rookies Cup sites. 10 - Graham & Brown Working with Graham & Brown has been great fun. They are one of the top 100 Cool Brands and produce beautiful wallpaper, including ranges from really well-known designers. We designed an upwardly responsive international ecommerce site that showed off the great range of products and helped drive international sales. 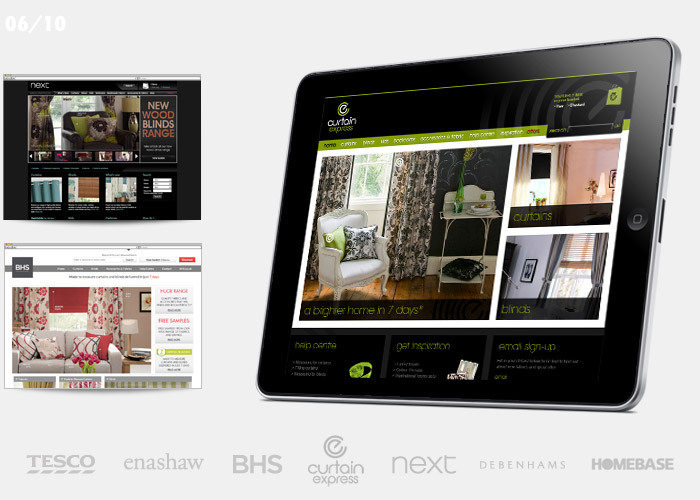 This was the first big responsive site I was really involved in and we were really pleased with the end result. As you can see from the small selection of projects above, we have changed massively as an agency during my time here, moving from a design and print agency working with local companies, to a pure digital agency working on multinational websites. Our growth and success has been underpinned by a great team, who I have been lucky enough to work and grow with over the years, as well as a core set of values that puts our relationships with our clients and within the team at the heart of everything we do. I am proud to have worked at Blueleaf for the last ten years and of the work we have produced during this time. 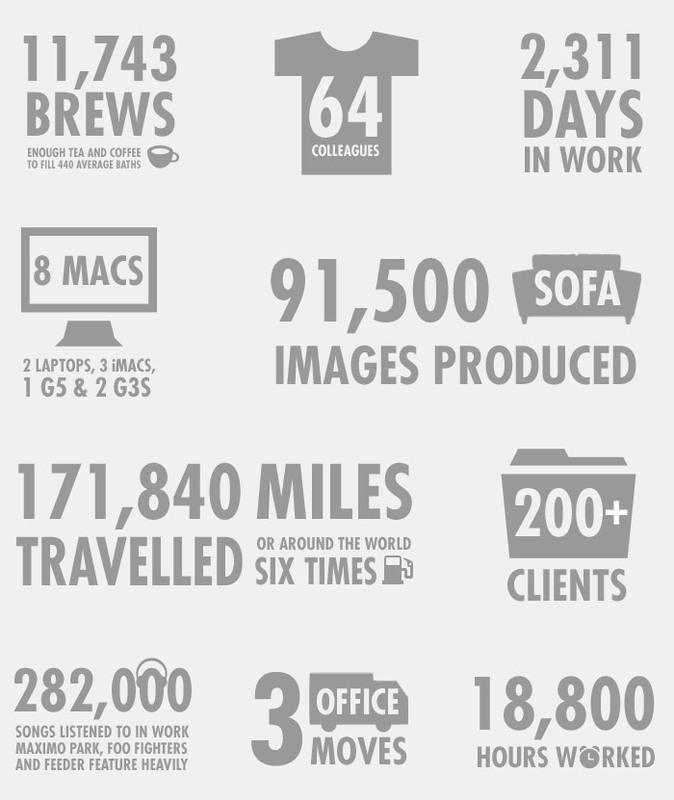 There are far too many projects, clients and team members to include in such a brief overview, but to everyone I have been lucky enough to work for and with, I would like to say thank you for making my first ten years with Blueleaf much more than just a job.